PowerPoint is an invaluable, powerful and exciting tool for creating presentation visual aids that transform average speakers into masterful presenters. Or is it? PowerPoint slides have been so dreadful and tortuous over the years that the phrase ‘death by powerPoint’ was coined. 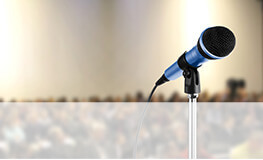 Let’s make sure you don’t cause ‘death by PowerPoint’ when you present. Let’s make sure you use your slides to set yourself up as the best presenter you can be! Are you setting yourself up to use PowerPoint as a lethal weapon? Are you guilty of the ‘kid in a toyshop’ syndrome, where your enthusiasm for your newfound slide mastery is clouding your judgment as a presenter? Have you thought enough about the need to concentrate more on your verbal and non-verbal communication than your visual aids? 1. Do you lack confidence as a presenter? Would you be horrified at the thought of presenting to an audience without the use of visual aids? 2. Are you guilty of using PowerPoint slides to take the focus off yourself? 3. Do you use PowerPoint slides as convenient palm-cards? Do you find yourself looking back at your slides to remember what to say? 4. Do you use PowerPoint to write your presentation? If you find yourself answering ‘YES’ to these questions, then there is a good chance you have been relying on PowerPoint slides to carry you as a presenter, rather than simply as a visual aid to highlight the key messages for your audience. You may have great technical skill in designing visual aids, but it may well be at the expense of developing your ability to communicate with your audience, and to properly connect with your audience. What is the purpose of slides? What should they look like? The purpose of slides is to reinforce your 3 key messages, not to remind you, the presenter, what to say next. Slides have the potential to create a visual, kinesthetic and maybe even an auditory connection between your audience and your message. In other words, they help stimulate your audience in a variety of ways that will help them to remember your content. 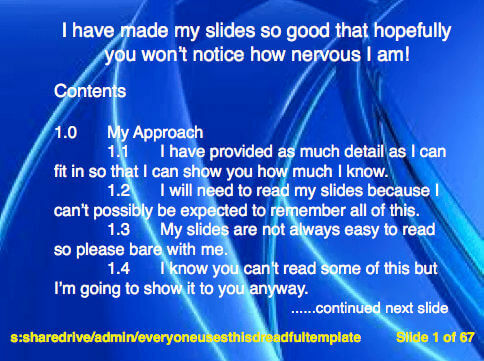 An ideal presentation with slides doesn’t cause ‘death by PowerPoint’. Delivering your message with confidence and charisma is simple, as long as you don’t use slides that disengage your audience. I believe the main reason many people don’t use PowerPoint to its advantage is they don’t know how to. So, I have listed my 10 tips for designing slides to help you set yourself up to be a powerful presenter who uses your slides as an aid to influence your audience to your way of thinking. Top 10 tips for designing beautiful slides! 1. Dark text on a light background. 3. Times New Roman or Verdana font style. 4. Reduce the number of slides to a minimum. 5. Replace words with pictures as often as possible. 6. Colour code graphs so people see the point of the graph easily from a distance. 7. Use beautiful clever graphics, not overused, tired ones. 8. Ensure your transitions from one slide to the next don’t distract. 9. Sound clips should add value not distract from the message. 10. Don’t use underline, italics, bold or shadow on your fonts. Only use key words on your slides and change the colour of the font if you must highlight a word.